Sleep is one of life’s great mysteries. Like quantum-gravity or the nature of blackholes, we still don't completely understand why we sleep—although we are learning more about it every day. We do, however, know that good sleep is one of the cornerstones of good health and with children headed back to school, young adults going off to university, and everyone adjusting to Fall, now is the perfect time to reconsider your sleep habits. Six to eight hours of sleep per night seems to be the optimal amount of sleep for most adults, and too much or too little sleep can have adverse effects on your health and wellbeing. Sleep deprivation is a widespread, chronic condition one that you might be suffering from without realizing it. Scientific consensus is that a sleep deficit can have drastic, serious, and far reaching effects on your health. For example, interrupted or impaired sleep can dramatically weaken your immune system. Some studies have shown that tumors grow two to three times faster in laboratory animals with severe sleep dysfunctions. A lack of sleep can also cause a pre-diabetic state, making you feel hungry even if you've already eaten, which can wreak havoc on your weight. Sleeplessness can seriously impair your memory; even a single night of poor sleep—meaning sleeping less than 6 hours—can impact your ability to think clearly the next day and even impair your performance on physical or mental tasks like driving and decrease your problem-solving abilities. When your circadian rhythm, a roughly 24 hours cycle in the physiological processes of your body, is disrupted, your body produces less melatonin, a hormone and an antioxidant, and has less ability to fight off diseases. Since melatonin helps suppress free radicals that can lead to cancer, this may be why tumors grow faster when you sleep poorly. Impaired sleep can also increase stress-related disorders like heart disease, stomach ulcers, constipation, and mood disorders like depression and anxiety. One study has even shown that people with chronic insomnia have a three times greater risk of dying from any cause. Lost sleep, like lost time, is lost forever. A persistent lack of sleep has a cumulative effect when it comes to disrupting your health. Poor sleep can make your life miserable. The good news is, there are many natural techniques you can learn to improve your "sleep health." Whether you have difficulty falling asleep, waking up too often, or feeling inadequately rested when you wake-up in the morning—or maybe you want the best sleep possible—you are bound to find some relief from my sleep suggestions below. Sleep in complete darkness, or as close to it as possible. Even the tiniest bit of light in the room can disrupt your internal clock and your pineal gland's production of melatonin and serotonin. Even the tiniest glow from your clock radio could be interfering with your sleep. Close your bedroom door, and get rid of night-lights. Refrain from turning on any light at all during the night, even when getting up to go to the bathroom. Cover up your clock radio, turn your cellphone facedown, and shut off your computer. Cover your windows—I recommend using blackout shades or drapes. Alternatively, you can wear an eye mask to block out light. It is not always easy to block out every stream of light using curtains, blinds or drapes, particularly if you live in an urban area (or if your spouse has a different schedule than you do). In these cases, an eye mask can be helpful. All life evolved in response to the predictable patterns of light and darkness, created by the movement of the sun across the sky. Artificial electrical lighting has significantly betrayed your inner clock by disrupting your natural physiological rhythms. Little bits of light pass directly through your optic nerve to your hypothalamus, which controls your biological clock. Light signals your brain that it's time to wake up and starts preparing your body for action. Keep the temperature in your bedroom no higher than 70 degrees F. Many people keep their homes and particularly their upstairs bedrooms too warm. Studies show that the optimal room temperature for sleep is quite cool, between 60 to 68 degrees. Keeping your room cooler or hotter can lead to restless sleep. When you sleep, your body's internal temperature drops to its lowest level, generally about four hours after you fall asleep. Scientists believe a cooler bedroom may therefore be most conducive to sleep, since it mimics your body's natural temperature drop and reflects the natural temperature change associated with the sun setting. Move alarm clocks, cellphones, and other electrical devices away from your bed. If these devices must be used, keep them as far away from your bed as possible, preferably at least 3 feet. Remove the clock or cellphone from view. It will only add to your worry when you stare at it all night... 2 a.m. ...3 a.m. ... 4:30 a.m. or constantly hear notifications going off throughout the night on your phone. Avoid using loud alarm clocks. It is very stressful on your body to be suddenly jolted awake. If you are regularly getting enough sleep, an alarm may not even be necessary. I gave up my alarm clock years ago and now use a sun alarm clock. A sun alarm clock combines the features of a traditional alarm clock (digital display, AM/FM radio, beeper, snooze button, etc.) with a special built-in light that gradually increases in intensity, simulating sunrise. Consider separate beds. Recent studies suggest, for many people, sharing a bed with a partner (or pets) can significantly impair sleep, especially if their partner is a restless sleeper or snores. If bedfellows are consistently interfering with your sleep, you may want to consider separate beds. Like Lucy and Ricky Ricardo, two beds in one room can do wonders for your sleep cycle and your relationship. Don't change your bedtime. You should go to bed and wake up at the same times each day, even on the weekends. This will help your body to get into a sleep rhythm and make it easier to fall asleep and get up in the morning. Establish a bedtime routine. This could include meditation, deep breathing, using aromatherapy or essential oils or indulging in a massage from your partner. We offer a wide range of essential oils at the Apothecary and have specialty blends available specifically for sleep and relaxation. The key is to find something that makes you feel relaxed, then repeat it each night to help you release the tensions of the day. Don't drink any fluids 2 hours before going to bed. This will reduce the likelihood of needing to get up and go to the bathroom, or at least minimize the frequency. Go to the bathroom right before bed. This will reduce the chances that you'll wake up to go in the middle of the night. Avoid before-bed snacking, particularly grains and sugars. These will raise your blood sugar and delay sleep. Later, when blood sugar drops too low (hypoglycemia), you may wake up and be unable to fall back asleep. Be sure to eat a healthy protein-rich dinner several hours before going to bed to help minimize late night snacking. Make sure to space your last meal of the day and bedtime by 3 hours. Take a hot bath or shower before bed. When your body temperature is raised in the late evening, it will fall at bedtime, facilitating slumber. Baths are showers can be relaxing and the temperature drop from getting out of the bath helps to signal your body it's time for bed. We like adding Magnesium Flakes and Lavender to the bath for added relaxation. Wear socks to bed. Feet often feel cold before the rest of the body because they have the poorest circulation. A study has shown that wearing socks to bed reduces night waking. Put your work away at least one hour before bed (preferably two hours or more). This will give your mind a chance to unwind so you can go to sleep feeling calm, not hyped up or anxious about tomorrow's deadlines. No TV right before bed. Even better, get the TV out of the bedroom or even completely out of the house. It overstimulates the brain, preventing you from falling asleep quickly. The glow from the TV disrupts your pineal gland function and misinforms your biological clock. Listen to something relaxing. Some people find the sound of white noise or nature sounds, such as the ocean or forest, to be soothing for sleep.There are many CDs, Apps, and online resources that can provide these soothing sounds and even guided meditations. Read something spiritual or uplifting. This may help you relax. Don't read anything stimulating, such as a mystery or suspense novel, which has the opposite effect. In addition, if you are really enjoying a suspenseful book, you might be tempted to go on reading for hours, instead of going to sleep. Journaling. If you often lay in bed with your mind racing, it might be helpful to keep a journal and write down your thoughts before bed. Personally, I have been doing this for over 10 years, but prefer to do it in the morning when my brain is functioning at its peak and my cortisol levels are high. Reduce or avoid as many drugs as possible. Many drugs, both prescription and over-the-counter, may adversely affect sleep. 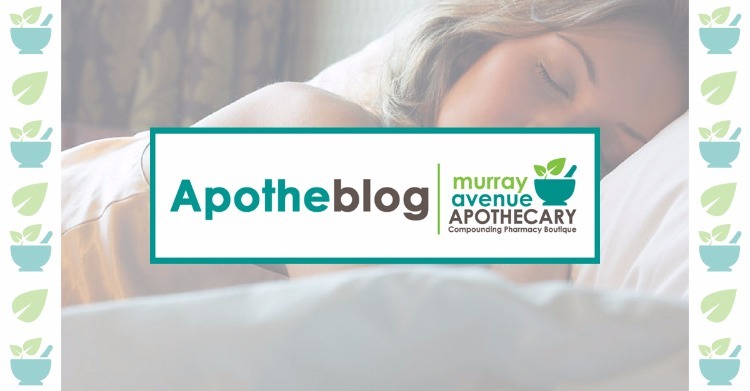 Schedule a Medication Review Consult at Murray Avenue Apothecary to learn how your medications may be affecting your sleep. Avoid any more than 1 cup of caffeinated drinks and only consume caffeine in the AM. At least one study has shown that, in some people, caffeine is not metabolized efficiently, leaving you feeling its effects long after consumption. So, an afternoon cup of coffee, tea, or soda will keep some people from falling asleep at night. Be aware that some medications contain caffeine (for example, diet pills). Even a small amount of caffeine can have a big effect on your sleep. Make certain you are exercising regularly. Exercising for at least 30 minutes per day can improve your sleep. However, don't exercise too close to bedtime or it may keep you awake. Studies show exercising in the morning is the best if you can manage it. Think about HIIT – High Intensity Interval Training. Lose excess weight. Being overweight can increase your risk of sleep apnea, which can seriously impair your sleep. Think about “intermittent fasting” to help use up Glycogen stores and burn fat. Have your adrenals checked by saliva testing available at the Apothecary. Scientists have found that insomnia may be caused by adrenal stress. The only way to know for sure is to be tested. If you are menopausal or perimenopausal, saliva testing can pinpoint imbalances. The hormonal changes at this time may cause sleep problems if not properly addressed. I do one-on-one consultations for individualized solutions. Together you, your doctor, and myself can work to come up with your individual plan. Make an appointment today by calling 412-421-4996. Increase your melatonin. Ideally it is best to increase levels naturally with exposure to bright sunlight in the daytime (along with full spectrum fluorescent bulbs in the winter) and absolute complete darkness at night. If that isn't possible, you may want to consider a melatonin supplement. In scientific studies, melatonin has been shown to increase sleepiness, help you fall asleep more quickly and stay asleep, decrease restlessness, and reverse daytime fatigue. Melatonin is a completely natural substance, made by your body, and has many health benefits in addition to sleep. Murray Avenue Apothecary carries several Melatonin supplements including Sleep Well, a liquid with 3mg of melatonin per serving, and Melatonin 10mg an instant dissolve tablet. Try CBD (Cannabidiol). CBD has shown benefit in many different chronic illnesses that are often related to sleeplessness. Chronic pain, Anxiety, Inflammation, and Gout are just some of the conditions that may be improved with CBD. Try Sleep Ezzs. One of more popular sleep supplements at the Apothecary is Sleep EZZs. It is formulated to help support the neurotransmitters dopamine and serotonin, which have a role in sleep cycles and anxiety. Get Tested. Try our Sleep Balance Test! Test several key hormones that rule the sleep-wake cycle. Restful sleep demands those being in balance. With an estimated 60 million Americans suffering from some degree of insomnia - whether that be early waking or the inability to get to sleep and stay asleep - the need to measure and monitor these hormone levels is paramount. To learn more about these supplements and how Murray Avenue Apothecary can help you get a more restful night’s sleep call 412-421-4996 to speak with a Pharmacist, visit us online at www.maapgh.com, or stop in during business hours to speak with one of our knowledge staff members. We hope to see you soon.